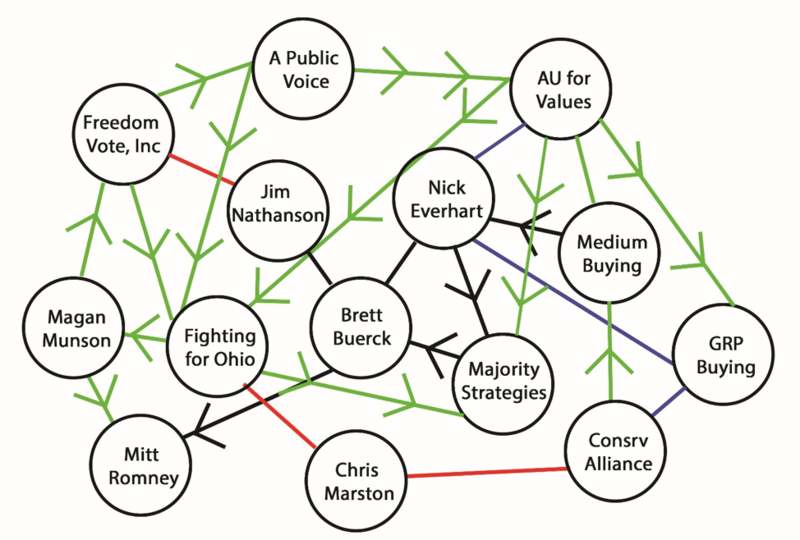 Newly filed Federal Communications Commission (FCC) documents reveal links between a newly created SuperPAC called Conservative Alliance PAC and the same Ohio Dark Money players behind Rob Portman’s 2016 single-candidate SuperPAC, Fighting for Ohio PAC. Conservative Alliance PAC is running attack ads in the Ohio Primaries, which go after Republican primary challengers who are allied with former Ohio Speaker, Larry Householder. The mailers and radio spots attempt to tie the candidates to a corruption scandal that swirled around Householder and his aides in the early 2000s. In a Shakespearean twist, the same aide who emerged most tarnished from that scandal – Brett Buerck – is one of the Dark Money players behind the anti-Householder candidate ads. Previous reporting from Plunderbund had established linkages between the Portman-aligned SuperPAC Fighting for Ohio PAC and another SuperPAC called Americans United for Values, that violated federal campaign finance law during the 2016 election cycle. 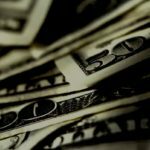 While Ohio Dark Money does have a specialty for picking off other Republicans during primary races, make no mistake, when the primaries are over, they will turn the firehose of dark money onto Democratic candidates. In 2016, Fighting for Ohio PAC spent almost $10 million on Ted Strickland attack ads. While some of Fighting for Ohio’s funding came from household names like Robert Mercer and Peter Thiel, nearly a quarter of it came from donors whose identities are obscured by dark money techniques. The dark money group that contributed the most to Fighting for Ohio PAC was a 501 (c) 4 called Freedom Vote, Inc. which funneled $1.9 million dollars to the PAC in the 2016 election cycle. In 2016, all of Freedom Vote’s $2.09 million in revenue was generated by a fundraising consultancy called MMM Consulting Inc, which is registered to a GOP operative named Magan Munson. She served as finance director for the Mitt Romney 2012 Presidential bid alongside Buerck, who also consulted for Romney’s campaign. As 3rd Rail Politics points out, in reporting that is eerily similar to Plunderbund’s “25 Billboards Outside of Cincinnati” series, the anti-Householder ads were purchased by GRP Buying, a company which Plunderbund’s reporting had previously connected to Nick Everhart and his other ad buying company, Medium Buying. For instance, while 3rd Rail Politics points out that the return address on one of the anti-Householder mailers is “a rent a private mail box service in Upper Arlington” the actual address on the mailers is “3136 Kingsdale Center #136, Upper Arlington” which corresponds to the mailing address used by GRP buying on previous FEC reports. 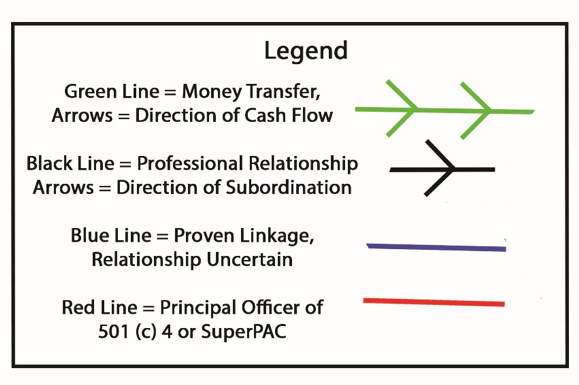 While 3rd Rail Politic’s coverage of this story builds on Plunderbund’s earlier work and should be commended, it is important to bear in mind that 3rd Rail Politics is widely considered to be bankrolled by Bill Lager, ECOT’s founder. Their editorial stance on these anti-Householder ads may be driven by politics rather than a deep concern for Republican unity. Larry Householder is an ECOT supporter and unlike many members of the Ohio GOP who returned Lager’s campaign contributions after the ECOT scandal broke, Householder did not. Householder is no stranger to scandal. In 2004, Householder fired his Chief of Staff, Buerck, and top fundraiser, Kyle Sisk, as their involvement with money laundering, campaign finance violations and “pay-to-play” tactics leaked out into the press. It turned into a maelstrom of scandal that threatened to sink the whole Ohio GOP. One of the more egregious of the scandals involved Jim Nathanson, a Dayton-based political consultant, who performed a variety of roles for the Montgomery County GOP and Dayton-based candidates like Mike Turner. In 2004, Nathanson, Buerck and Sisk were accused of laundering money into political campaigns, skirting campaign finance law to install their cronies and enriching themselves along the way. Buerck and Sisk were paid about $9,000 a month out of a GOP county operating fund that had just accepted a large donation from a pro-Charter School nonprofit. The fund was supposed to be used for workaday operating expenses, such as office supplies or administrator salaries and thus was not subject to the same stringent regulation as political accounts. Instead, they used the money for explicitly political purposes: Nathanson hired Buerck and Sisk to promote Sen. Jeff Jacobson’s candidacy for Senate President. Jacobson was also accused of encouraging his allies to donate to a nonprofit organization called the Ohio Taxpayer’s Association, that was running negative ads about an ally’s opponent. In its reporting on this matter, 3rd Rail Politics failed to disclose that one of its contributing writers, Scott Pullins, was serving as the Executive Director of the Ohio Taxpayer’s Association while it was investigated in conjunction with the Jacobson/Nathanson scandal (pgs.9-10). Jim Nathanson is also the principal officer of Freedom Vote Inc., the largest dark money donor to the Portman-aligned Fighting for Ohio PAC in 2016. Freedom Vote, Inc. also made a “grant” to A Public Voice, which donated to the Everhart linked SuperPAC Americans United for Values in 2016. Everhart was fired in disgrace from the Delaware, Ohio Republican consulting firm The Strategy Group for Media, and in the fallout from the nasty breakup, convicted of a felony in a lawsuit brought by his former employers. Afterward, Everhart went to work for Majority Strategies, a Florida-based direct mail firm. Then and now, Ex-Householder aide Buerck was serving as Majority Strategies’ CEO. Majority Strategies was Fighting for Ohio PAC’s second largest vendor in 2016, receiving $450,000 dollars in payment. 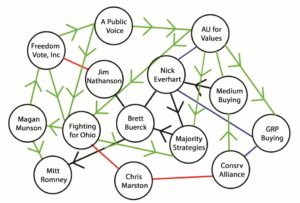 Americans United for Values, which is associated with Everhart, donated to Fighting for Ohio PAC and used Majority Strategies to send out mailers in the Georgia Sixth special election in 2017. As always, with this Dark Money stuff, things get confusing and tangled, but the bottom line is this: Ohio Dark money groups are taking sides as Larry Householder squares off against Ryan Smith in a contest for House Speakership. 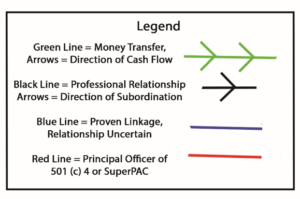 The dark money players take potshots at Householder by linking him to the money laundering, kickback and pay-to-play scandals of yesteryear in mailers and radio ads, while failing to disclose their own extremely deep involvement in those same scandals. Householder allies use their “astroturf” politics blog 3rd Rail Politics to punch back, but they also fail to disclose their own connections to the scandal and interest in the outcome of the Speakership scuffle. We here at Plunderbund don’t care if both factions go nuclear on each other each other in their proxy war for House Speakership, but after the primaries, Ohio Dark Money will set its sights on Democrats. If you think the cynicism and bad faith on display now are reprehensible, just wait to see what the general election has in store. Danielle Harlow is a Social Scientist living in Columbus, Ohio, who won a game of Jeopardy! once. Follow her on twitter at @tiberisdonors. The Orwellian Trump Downticket Democrats Outraise GOP Opponents. Again.